CORPUS CHRISTI, TX - On Saturday, November 17, Corpus Christi International Airport (CCIA) will host a first of its’ kind in South Texas. One of the runways at CCIA will be closed for a few hours to allow the community to experience the airport in a whole new way. The 5K is a competitive, chipped run for both experienced and not so experienced runners and walkers. Prior to the start of the 5K, the Patriot Guard Riders will “ride” the runway beginning at 7:45am. Immediately following the ride, kids will be lined up for a quick 1K. 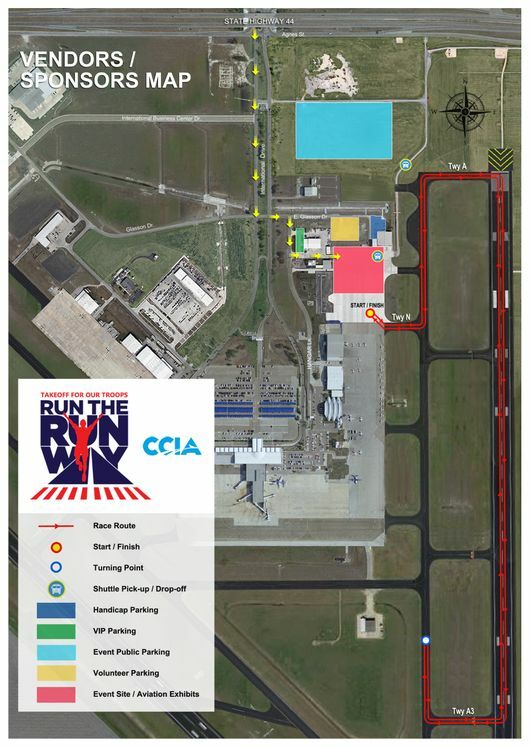 The Wings of Texas will gather at the starting line and takeoff with their Captains and runners working as a team at around 8:08am. And at 8:10am, more than 700 runners will takeoff for the 5K. Members of the media can contact CCIA Marketing Manager Kim Bridger-Hunt with questions about the event at 361-774-7871. Media who would like to cover the event can park in the VIP parking lot while they are at the site. Directions: Turn on to International Drive like you are heading to the terminal. Take a left on Glasson. Then a right on Hangar Lane. The VIP parking lot is there at the Aviation Maintenance facility. The entrance gate is just south of the building.